Continue your learning journey and discovery of wild plants. Learn about new plants and things you can make with them that were not covered in our introductory Wild Edible & Medicinal Plants Course. Whether your are at home or on the trail, continue learning how to use a spectrum of wild plants for food and medicine. This course covers a range of uses from first aid to integrating wild plants into your daily diet and personal care. 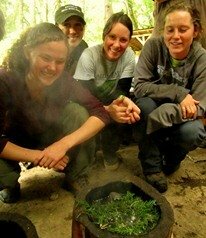 Participants learn additional skills for plant identification, ethical harvesting and stewardship practices, processing, cooking and preparing wild plants.